An empty trail, a faint trace of weed-strewn path or a massive fill; by its nature, a railroad right-of-way leaves a distinct mark on the landscape. The Terre Haute and Richmond Railroad, chartered in 1847, and renamed the Indiana Central in January of 1851, was the original east-west rail line in Indiana. It ran past my house and I can remember the original depot that stood a block away next to my grandmother’s house in Centerville. Traces of the original line were still easy to find in the 1960s and the Pennsylvania used the section near my home as a siding after the major track realignment at the turn of the twentieth century. To the west of Centerville there was a short grade up Jackson’s Hill with a long fill before and after the summit. About a mile west of town the old line crossed Noland’s Fork River on a short pile trestle, while the new line utilized a multi-span concrete arch bridge. When I was young, the old right-of-way was a dirt road that you could navigate by auto or bicycle down to the river. I’ll never forget my discovery of the stubs from one of the trestle bents in the middle of the river. It seemed unbelievable they could still be there more than a century later. At the turn of the twentieth century through the early 1920s, the Pennsy expanded west of Pittsburgh by consolidating several lines through Ohio, Indiana and Illinois. Key among them was the Pittsburgh, Cincinnati, Chicago and St. Louis, or the Panhandle Route, as it was known. 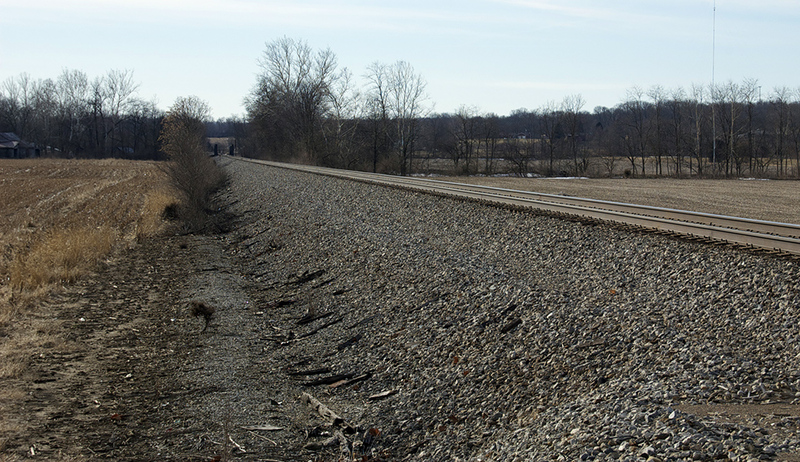 In Centerville, the old Indiana Central line was abandoned in place with the new double tracked line relocated a few yards to the north. The new line passed on the opposite side of the Centerville depot and a new, higher fill was built next to the old one west of town. In this photo, you can see the height of the original fill about halfway up. What I always thought of as double track was actually operated as a single-track line with a continuous passing siding. Interlocking towers and crossovers at strategic locations, allowed operators to route trains past each other in both directions to maintain a smooth and efficient traffic flow for both freight and passenger service. The PRR’s Columbus, Ohio to Indianapolis, Indiana line ran on this long fill west of Centerville. 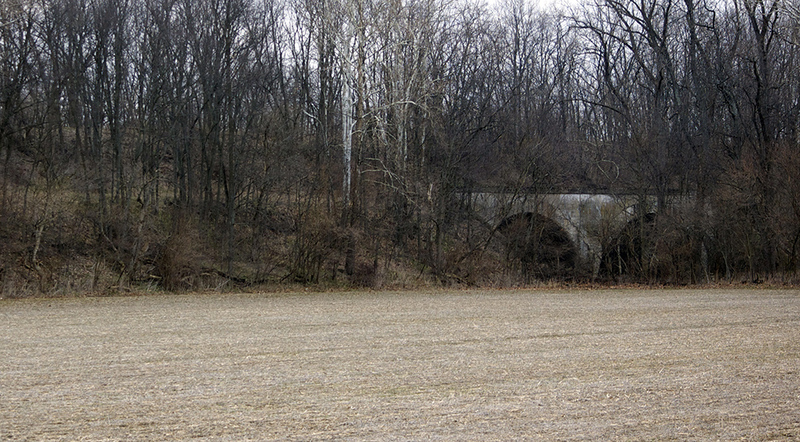 Bridges over water and highways were of poured concrete construction like the multi-arch span seen here next to Hiser’s Station, where a branch of the THI&E interurban line went north from the main line along US 40. Running parallel to the south was US Highway 40 or the National Road: the nation’s first federally funded highway, commissioned in 1811. Prior to the 1930s, the right-of-way of the Terre Haute, Indianapolis and Eastern Traction Company followed US 40 eastward from Indianapolis to a connection at Richmond with the Dayton & Western interurban line of Ohio. At a junction known as Hiser’s Station, a branch of the THI&E went north and crossed under the PRR via a stone arch bridge. 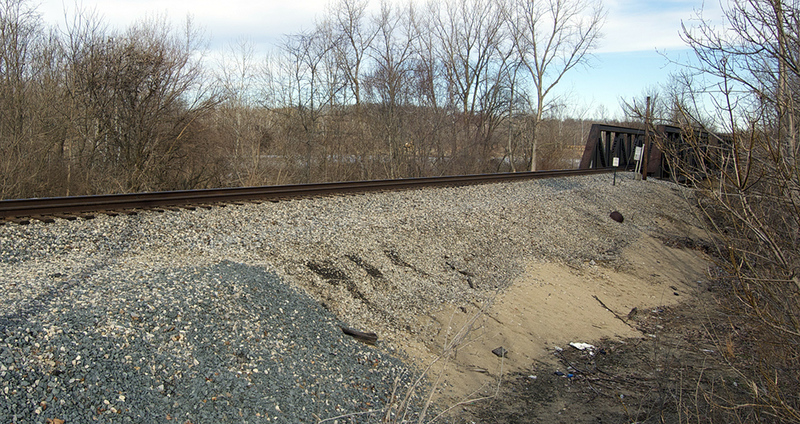 A railroad right-of-way may last for a very long time and can be traced decades later if you know what to look for. 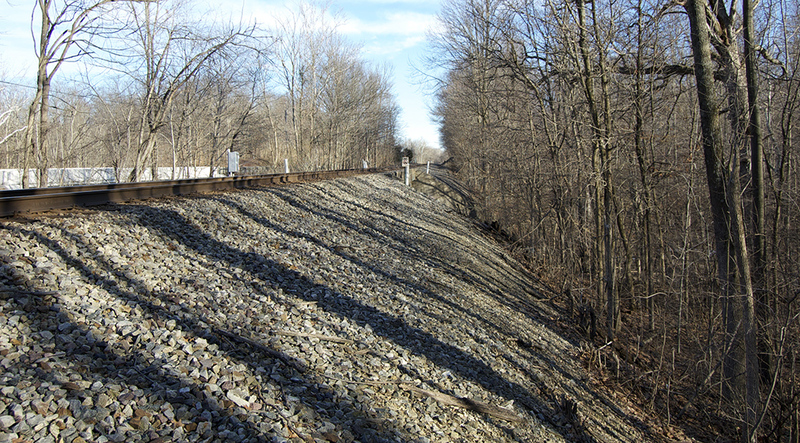 Like many places this part of the country was criss-crossed by rail lines, leaving many examples of abandoned roadbed. This post focuses on the right-of-way itself. The following posts cover individual aspects of the track structure. The photos illustrate features that are simple to model, if only people would think to include them from the planning stages. Other details can be modeled at anytime, even long after the track is laid. The fill west of Centerville was a large earthwork that reshaped the surrounding landscape. More typical is a low fill that raises the track above the floodplain, as illustrated by the following images. So, let’s have a look at track from the ground up. I like this first image for the way the tree shadows define the contour of the fill. Notice how gentle the angle of repose is for the crushed limestone material. Anything steeper would render the fill unstable. Notice also that the slope isn’t flat but has a slight hump to it. The double shoulder of the ballast layer is another little detail that’s easy to ignore, yet adds much to the model. A fill like this needs space to look right on a layout. Archaic design conventions from the past, like multiple laps of parallel track on different levels often forced modelers to use slopes that are too steep for realism. It’s encouraging to see more attention given to proper right-of-way engineering practices now. Photo 2015. A bit further south we see a mix of material near this bridge. 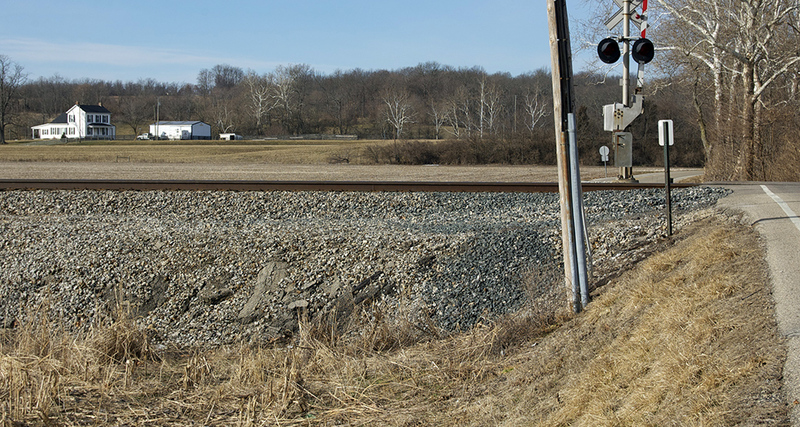 The photo reveals areas of sand and dirt near the base, with fresh limestone on the left from maintenance performed at a grade crossing just out of the picture. The lesson I see here is that the right-of-way isn’t a homogenous expanse of one material. A fill like this will show different stages of age as even stone weathers over time. A mix of material like this can tell a story and add visual interest. Photo 2015. On the opposite side of that road crossing there is further evidence of fresh limestone. In this image it’s how the contour of the terrain coming off the highway and the intersection with the railroad fill. Apparently some track work was done on both sides of the crossing. Notice there is a flat area of stone next to the track for a short distance. (A place for the equipment to work from?) The vegetation patterns are also an interesting study. Photo 2015. From the same location, here is the line in open country. The fill maintains a level grade and once again, the slopes are appropriate for the material. The bottom of the fill is an interesting study for the way it meets the crop fields. Notice the clear area and the encroaching shrub growth further back. Norfolk Southern maintains this line with care and keeps vegetation well back from the track. Photo 2015. My former layout represented a yard area with multiple tracks, so the opportunities to model a fill were limited. From the outset though, I was conscious of how easy it is for everything to look flat. Therefore I doubled up the layers of roadbed and the plywood support to create more room below the track. The only place this was really effective was the tail track above my workbench. Because of the large sheets I used around the layout, the track looked like it was sitting on a table top. (Because it was sitting on a table top.) It’s something I could do a better job of modeling in the future. Even in areas where the terrain is essentially flat, there will be a sense of separation, unless the track is just buried. Next time, we’ll look at ballast. I know, how much can be said about a bunch of rocks? I’m sure we’ll find something.